For a child, getting themselves dressed is a big accomplishment and can boost their self-esteem. 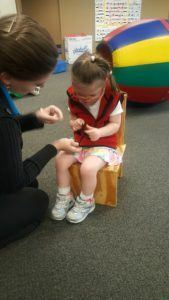 There are many skills that are needed to get dressed including fine and gross motor skills, bilateral integration (the ability to use both sides of your body together with coordination), sequencing (putting skills together to achieve a final task), strength, motor planning (the ability to determine and carry out a series of motor actions), and sensory processing. Children can begin assisting with dressing before their first birthday and gain independence in the upcoming years before being able to fully dress themselves at age 5. What dressing skills should my child be able to do and at what age? The answers are below. Encourage the skill prior to the age it should be mastered. At first you will have to completely do the skill for your child. Talk to your child telling them all the steps to complete the skills. Progressively ask your child to help you with each step. Praise your child for their help with the task and successful completion. You will be teaching your child pride, sense of accomplishment and trust that you think they can. Great job parent! Your child should be able to take his shoes and socks off. He/she should push their arms in sleeves once the shirt is placed over their head. A 1 year old should push legs into pants when the pants are held for them. He/she should be able to help pull pants down. A 2 year old should remove their own jacket. A 3 year old should be able to take off pants. He/she can button and unbutton large buttons. Your child will unzip and zip jacket once zipper is started. 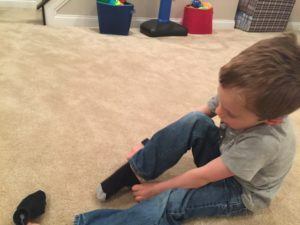 Three year old’s put on socks and shoes by themselves. He/she should be able to put on shirt and pants independently. A 4 year old can take off his/her own shirt. At this age, your child can snap, button, zip, and buckle a belt. Putting socks on correctly is a skill at age 4. 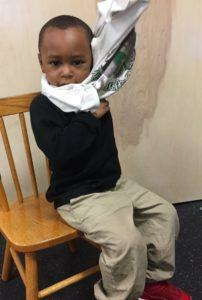 Your child should be able to dress and undress himself including all fasteners and tie his shoes! You now have extra time for you!! Continue to challenge your child now that you know what skills they should be doing and when. Push their potential to be independent. Praise their successes! This is the way to raise a happy, confident child!! If you need help teaching your child skills reach out to ABC Pediatric Therapy Network. We are here for you! If you have questions, call us or visit our website at http://www.abcpediatrictherapy.com.